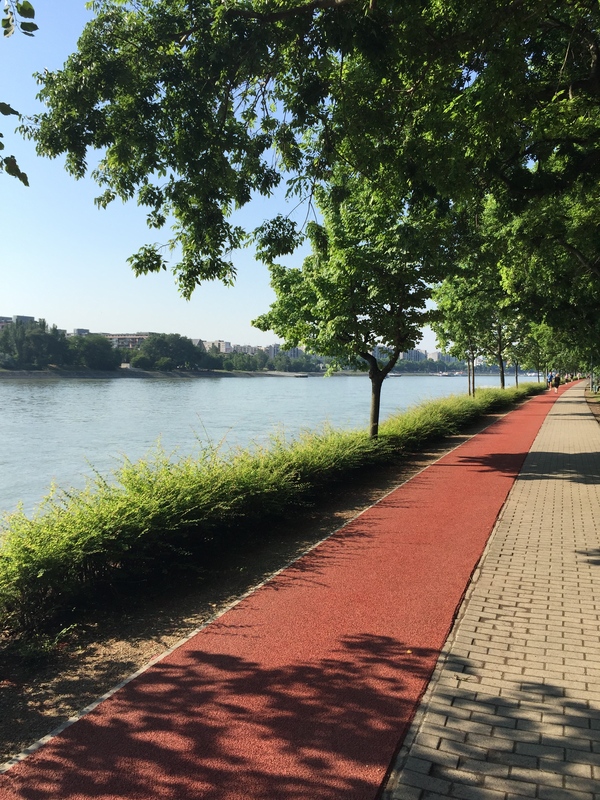 As Hamish and I did our almost daily walk around Margit Island today, I was thinking about how I had not written a post in awhile. From that point on, I pondered this post. First I thought about some of the things that had been happening lately and what I had been doing. One of the big things was a trip home in May. It was a good and difficult trip home. I was going back to see my family for the first time after the tragedy of the accident and my mom’s funeral. I felt a strong desire to go home but I wasn’t sure for what exactly. But as I have found out, in grief, there isn’t always a way to explain things. So I picked a time when my brother would be home as well so the whole family would be together and went. It was hard to be home because my family and I, we are all still very raw and grieving. Despite the tragedy, the same joys, but also the same tensions still exist and are even somewhat amplified due to the raw emotions. It was also very good to be a part of being home again. There is something comforting about it. While I was home, we went through all my mom’s belongings, clothes, jewellery, shoes, etc. My sisters, my dad, and I sorted, removed, kept, and cried. It was stressful but also healing. There is healing in being able to let go. We kept a few things that we each felt were special or important. There is sadness but also healing in remembering Mom in her favourite sweater or necklace. It felt good to be close to her that way. But also be able to let her go in a small way, knowing she wouldn’t need those things anymore because she is rejoicing in heaven. While I was home, there was a wonderful trip to Niagara Falls with some amazing friends. There were six of us. We ate and drank, we laughed and cried, we played and had lots of fun! It was both light hearted and deep. 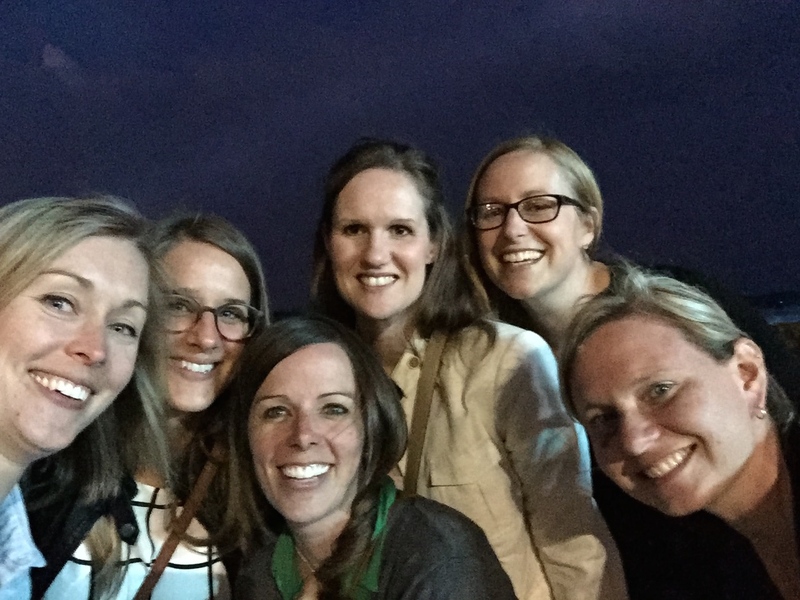 It is amazing to be together with friends who know me and who I know so well. Then it was time to go home again. Back to my husband and my puppy. To get back on a plane again and do the jet lag all over again. I was not eager to do that but I was eager to get home. To be with my family and see my Budapest “family” and friends. And to stop travelling for a little while. Although I am very thankful that, as humans, we have the ability to fly on airplanes. I appreciate that I can live far away from my home and still be able to go there occasionally. But after so many years of flying long flights and jet lag, I hope to avoid travelling on a plane for awhile. If I could avoid it for at least the next 6-12 months that would be amazing! It would also be weird but I think I would just be so glad. Since being back home for the past month, I have been enjoying the quietness and peace of my daily life. I walk our puppy and then I come home and I clean the house and I make dinner. And I love it! Last night, Niall came home late from an event he had, and I had been home most of the day. By about 4 or 5pm, I felt like I had done everything that I needed to do that day and I almost felt bored! It was a strange but kind of nice feeling. I usually have so many things to do that I never feel bored! I don’t think I will always want to feel bored but for that moment it was okay. Summer is coming and we have a mostly quiet summer ahead. We both have some work to do on courses we are taking. We will spend some time vacationing in nearby Croatia. We will have a few visitors to Budapest throughout the summer. And we will celebrate our first wedding anniversary. Every day I am thankful for our amazing, wonderful wedding that we had last summer. And every day I am thankful that it is done. I am thankful that I don’t have to do wedding planning and think about avoiding tan lines. I am thankful that I feel such peace and relaxation and I pray it will continue throughout the summer! 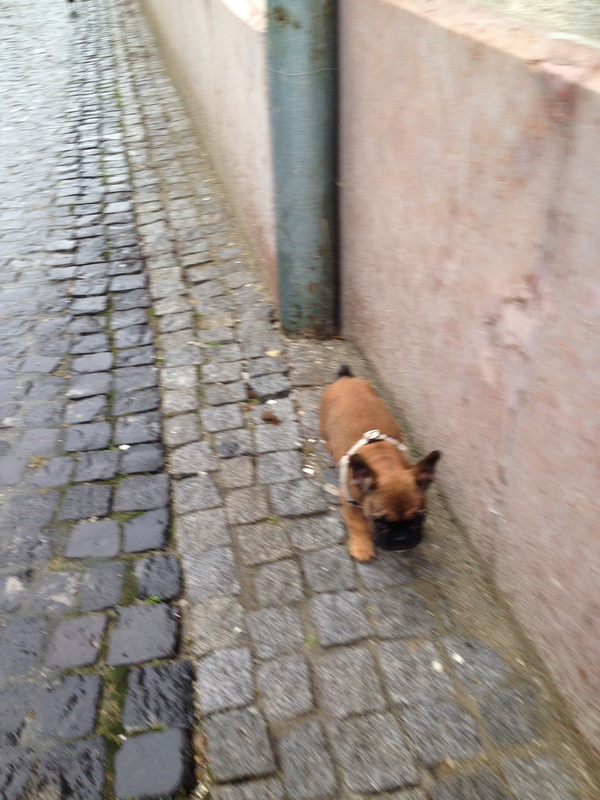 Getting a Puppy in Hungary…bringing Hamish home! Last year, we decided we would get a puppy. My husband’s family had always had dogs at home. My family had a dog when I was little. So we decided that after we were married and settled in our new home, we would get a puppy. We did some research and found the best breed to get was going to be a French bulldog. 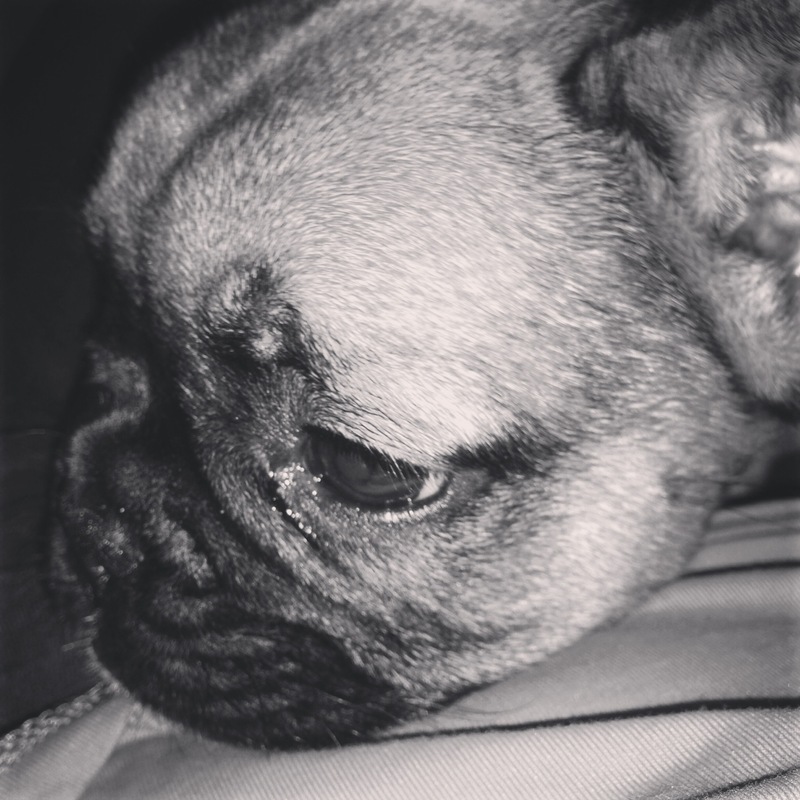 French bulldogs are fairly small dogs, which would work for us so that we could travel with him. They also tend to be dogs that don’t need a lot of exercise (besides at least one or two daily walks) and they are quiet so they are good apartment dogs. We have also found out that they can be quite stubborn. 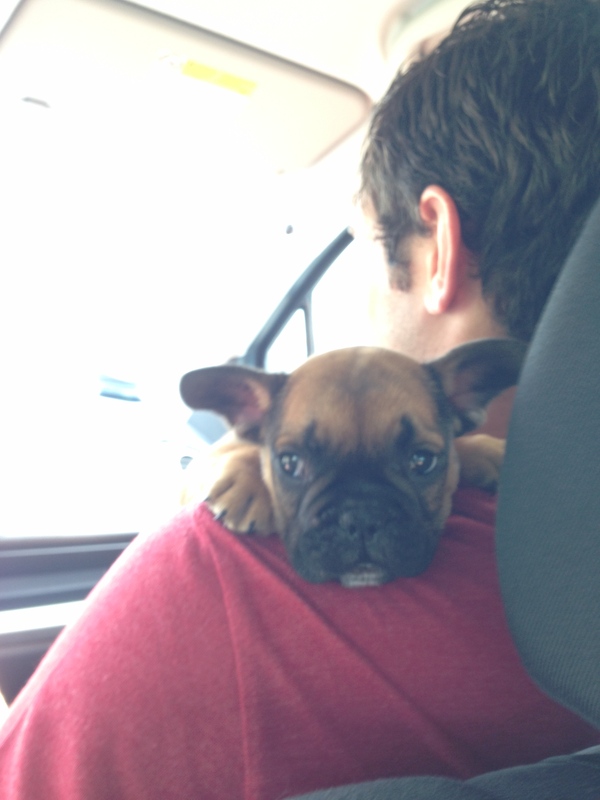 We went to pick up our little 7 week old brown French bulldog on Saturday, September 6, 2014 with our friend from school. We had to drive about an hour out of Budapest to meet the people we were getting him from. He was the cutest, littlest puppy and he was so sad to leave his family but we were so happy to have him! Hamish was home! It didn’t take long to realize how much work having a puppy is. There can be numerous comparisons made to having an infant. The first week he was home with us, I also realized that I had no idea what to do with a puppy. If he was going to be left to me (because Niall is at school) to take care of he might be the worst behaved puppy ever. Hamish tended to pee or poo wherever he needed to in the house because we could not take him outside because he did not have all of his shots yet. There was a lot of cleaning up to do. But he certainly loved to sit and cuddle with us and sleep a lot. Shortly after we got him, I also got a job at school where I would be working full time. We had to find a place for Hamish to be taken care of during the day. We could not leave him alone for more than a couple hours. We managed to find a dog boarder who would pick him on Monday morning and drop him back off on Friday afternoon. We were weekend dog owners! I had no idea I would be that person who brought her dog everywhere and sent him to puppy camp all week! But it was the only solution and so we had to say good-bye to Hamish during the week. We have been doing this for several weeks now and Hamish returns on the weekends happy, hungry, and ready for cuddles. We found out that he has any number of dog friends to play with and cuddle with at night so he gets a bit lonely with us at home. Training Hamish was initially a big concern mostly because I had no idea how to train a puppy. After being at puppy camp, he has seen some good examples from the big dogs so that helps with the potty training. He is usually able to do his business outside now that we are also taking him out to the park at least 2-3 times per day. He loves running around the park and hanging out with other dogs, who are usually bigger than him and scared of him! When we were finally able to take him outside we got a harness and a leash. We soon learned the stubborn side of Hamish and he refuses to walk on the leash. He will sit down on the sidewalk and not move until we take the leash off. This hasn’t been a huge concern because he does an excellent job of walking behind or beside when we are outside. If he ever strays away then we can easily get him back on track by calling him or giving him a treat. A couple weeks ago, Hamish got sick and had some intestinal problems. We had to take him to the vet 3 times in 6 days to get him checked and for medicine. After that he seemed to be doing better so off he went back to puppy camp. When he came back, he was a little bit sick again so he got more medicine. For a couple days he was doing well so we took him back to the vet to get his 4th vaccination shot. The next day he was very, very sick. So sick that we had to take him to the vet immediately. He had to have an IV and several shots and more medicine. Luckily he started to feel better very quickly after that and seems to have continued to improve. Because Hamish was sick and the weather in Budapest got cooler and rainy, Hamish was quite cold when I took him out for a walk one day. I thought he could use some more insulation so I got him a little coat to wear when we went out for walks. The first time he wore the coat was after I gave him a bath and he was shivering so I put the coat on him to keep him warm. I think he might have thought it was a straight jacket because he did not move for at least an hour or two after I bundled him in a blanket and put him in his bed. The next time I put the coat on him was when we were going for a walk. He stood frozen in the kitchen for several minutes with one paw up because I could coax him to the door with a treat. After taking him downstairs and putting him on the sidewalk, he still refused to move so eventually I had to take the coat off and then he willingly walked to the park! Again his stubbornness is showing as well as his dislike for thinks that restrain him apparently! We are looking forward to many more adventures with the newest member of our family here in Budapest!